Most domestic cats are friendly, peaceful animals who love their human family more than anything. But just like people, each cat has its own distinct personality – some are very calm, others are quite stubborn, some are bold and others are intolerant. No matter what your cat may be like most of the time though, there are situations that can make even the most peaceful cat quite aggressive. Although you may see such situations as normal (such as a visit to the vet), your feline pet may perceive them as dangerous or somehow threatening. And what does a cat who has been put in a dangerous situation do? She bites and claws, trying to get out of there as fast as possible. Obviously, no one wants to get bitten or scratched (people and furniture included! ), but that’s exactly what happens when you have a scared and aggressive cat on your hands. Unless, of course, you have a cat muzzle laying around. You don’t? Then this article is for you. A reliable feline muzzle could be thought of like first aid kit for cats who are either in pain, are injured or are acting aggressively towards everyone and everything around them. They can help you, the pet owner, calm your cat down and keep everyone around you safe and sound, including your kitty. To help you find such a device, our research team has read advice on cat muzzles by multiple veterinarians, as well as hundreds of reviews on the internet. The result is the list of the best cat muzzles money can buy. If your cat gets nervous during her routine vet visits, such as during eye and ear examinations, dental cleanings, injections, etc., it’s wise to have a muzzle in your bag in case your kitty gets too nervous and starts biting people around her. Obviously, if your pet is normally pretty calm, you don’t want any rigid, too-restricting muzzles, but flexible and comfortable ones. The muzzle from Downtown Pet Supply is just like that. Made from strong nylon fabric, with an adjustable Velcro strap that allows easy fit, this muzzle is durable but flexible, which means it’s quite comfortable for the cat but still very difficult to get out of. Importantly, it goes over the feline’s eyes, which is always a plus with muzzles, as it can help calm down the animal. The device has one hole, which is placed around the nose so the cat can easily breathe. This is an excellent, affordable cat muzzle for grooming, as it stops the animal from biting in a comfortable way. It’s in a classic black color and comes in two sizes: medium and large. If your cat is overweight and has some digestive issues, the best thing you can do for her is help slow down her eating process. Many cats eat way too fast for their own good, which can not only lead to excess pounds, but bellyache and digestive problems. 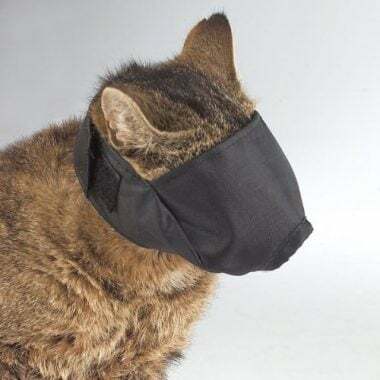 A cat muzzle such as this one from the Company of Animals, can help you help your kitty eat slower, and as a result, become healthier and happier. This feline muzzle is ideal for fast-eaters: it’s sturdy but lightweight, with many openings all around the cat’s mouth, nose and entire face. It comes with an overhead security strap which allows a perfect fit, no matter the size of your cat’s head. Since it’s made from tough and durable thermo plastic rubber, this muzzle not only offers maximum protection, but is dishwasher friendly – always a huge plus as fast-eaters are also usually messy eaters. Since this is a 5-inch muzzle, it’s best suited for large and overweight cats. Do you groom your cat regularly? 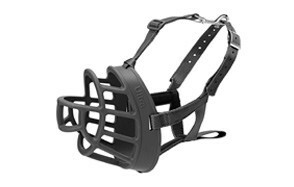 If you do, and he bites when he gets washed or has his nails clipped, you need to check out the nylon cat muzzle from Xbes. Made of nylon, this muzzle is flexible enough to be comfortable for the pet, but sturdy enough to ensure safety of everyone involved. This cat muzzle is super-easy to put on thanks to the Velcro strap, which allows you to adjust the device according to the size of your pet. The nylon fabric means the device is durable and comfy, guaranteed to last for years. It’s also water-resistant, which makes it highly convenient for grooming and washing. There is one hole in the mask, which is located in the nose area so your kitty can properly breathe. 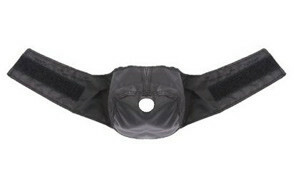 The mask is in black color and comes in three different sizes: small, medium and large. Make sure you buy the muzzle that fits perfectly on your pet. If your kitty is a biter and a chewer, you need a comfy but sturdy muzzle that will prevent him from acting out - but in a safe way. This can be easily done using a muzzle from Zoopolr – a good-looking, breathable mesh muzzle that prevents cats of all sizes and breeds from biting and chewing. Made from tough nylon mesh fiber, this mask is strong but quite comfortable for the wearer as it’s flexible and features a hole on the nose area for easy breathing. Plus, the fabric of the mask itself is entirely breathable, adding to the comfort of the animal and making any task easier for the groomer. Although not a particularly tight muzzle, it’s easy to put it on and take it off, thanks to the adjustable strap and Velcro fasteners that come with it. The Zoopolr’s mask comes in two sizes, S and L, and two colors – blue and pink. Most pet groomers and veterinarians cannot do their job properly without using cat muzzles. And it’s no wonder really, considering that most felines are not particular fans of vets, groomers or anything and anyone out of their ordinary. 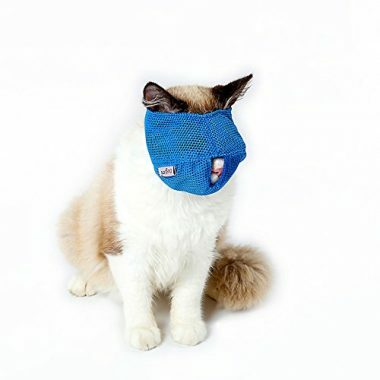 Enter Guardian Gear muzzle – made of solid nylon fabric, this mask is strong enough to prevent even the feistiest of cats from biting, and comfy enough to calm them down. 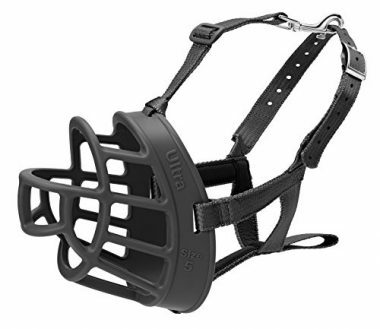 This muzzle comes with a fully adjustable strap and with Velcro fasteners which ensure an easy fit. Putting this mask on as well as taking it off is a piece of cake for the owner, but a seriously difficult task for a cat. The muzzle covers the pet’s eyes which, practice has shown, helps with nervous and anxious cats, as dark helps them calm down. There is one hole in the nose area so your kitty can breathe. The muzzle comes in one color, black, and three different sizes: small, medium and large. If you want to prevent your kitty from biting you and other people and chewing on things such as your precious furniture, but you want to do it in style, check out the muzzle from Alfie Pet. Made of tough, jet black nylon, this cat muzzle is not only great at preventing your pet from meowing, biting and chewing, but it actually looks great – perfect for felines who love to feel pampered at all times! This mask has a Velcro tape closure that allows a super-easy fit. 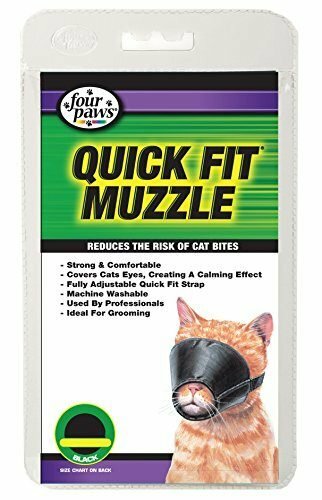 If you’re in a hurry, putting this muzzle on your cat’s head won’t take much time – in fact, it’s one of the fastest to put on and take off on the market. The mask covers the feline’s eyes and comes with one small hole in the nose area so the animal can breathe. Since it’s made of tough nylon, it’s sturdy and durable, guaranteed to last for years. This stylish black muzzle comes in three different sizes: small, medium and large. If you’re looking for a simple, affordable muzzle that will help you clip your cat’s nails or wash her without her biting you in the process, the Quick Fit Muzzle by Four Paws may be ideal for you. Made of nylon, this feline muzzle is great at preventing bites, chews and even meows. The Four Paws muzzle covers the animal’s eyes, which has been shown to create a calming effect - a particularly useful feature when dealing with an aggressive cat. The muzzle comes with a fully adjustable Quick Fit strap, which as the name suggests, ensures a quick and easy fit no matter the size of your cat. The nylon is completely washable, which is always a plus as it allows you to keep the mask hygienic. 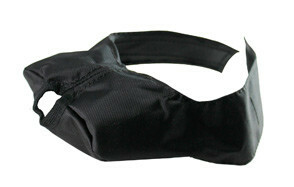 The Quick Fit muzzle comes in one color, classic black, and two sizes: small and medium. It’s no secret most cats hate vet visits. Although you’re there for their own good, they bite, scratch, meow and chew on things, desperately trying to get away from whatever they perceive as dangerous. For the owners of such felines, a full-face muzzle can be a life-saver. And this particular feline muzzle from Dogs my Love, is just that kind of a device. 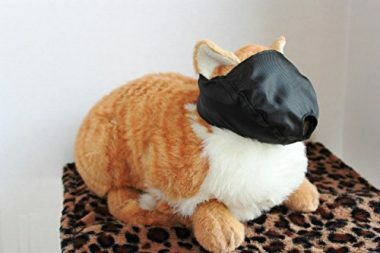 Made of strong nylon fabric, this full-face mask helps prevent biting and chewing and can help you teach your pet proper behavior, whether you’re at the vets, pet groomer or just in your own apartment. The muzzle comes with a simple Velcro fastener on the back, which allows easy adjustment. Of course, there is a hole in the nose area for easy breathing. 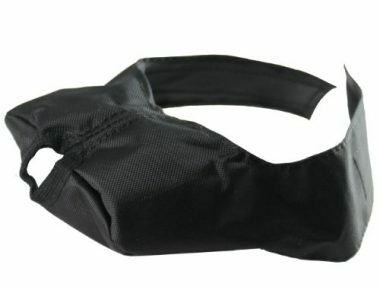 This cat muzzle comes in one color, black, and one size which is most suitable for medium sized felines, around 6-12 lbs. While your kitty may be a perfectly well-behaved pet most of the time, vet visits tend to provoke even the calmest of animals. This is because cats, always on the lookout for something dangerous, perceive things that are out of their ordinary as threatening. As a result, they can become nervous, scared and even very aggressive. This can lead to loud meowing, scratching and even biting. In fact, if you have ever taken your kitty to a groomer or a vet, it’s likely you already have scars to prove it. Unfortunately, it can be hard to teach a cat to behave differently when she’s scared for her life (those routine vaccinations? Life-threatening situations for your cat). In those cases, the best thing you can do is try to calm her and physically prevent her from attacking you and other people around you. And the product that can help you with that? Yep, cat muzzles. The only issue is, with so many different feline muzzles on the market, it can be difficult to find the right product for you and your kitty. That’s why we created Our Top Picks – whichever muzzle you choose from that list, you won’t regret it as long as you buy the right size. But if you want more information about these cat masks, you’ve come to the right place. Below, we talk about what to look for when looking to buy a cat muzzle, what the benefits of using them are, as well as how to safely use them and keep your kitty calm in the process. We also answer some of the commonly asked questions about feline muzzles, so be sure to check out that section as well. If you want a reliable, durable and comfortable muzzle for your cat, it’s important to pay attention to details. For instance, if you need a cat muzzle for meowing, you want different features from someone looking for a muzzle that helps slow down the eating process of his pet. So, to find the right muzzle for your pet, pay attention to the following features. As mentioned, it’s important to buy the product that fits your and your cat’s needs. A muzzle for grooming should have different features from a muzzle for eating. For this reason, it’s crucial you first decide what the mask will be used for. And if you’re looking to correct several behaviors with a muzzle? Purchase a couple of masks. Practically speaking, one cat muzzle made of washable nylon is all you need for proper grooming and regular vet visits as it stops the cat from meowing and biting. But if you need to slow down the eating process of your kitty, then you most definitely need to buy a muzzle specifically designed with that goal in mind. Luckily, most muzzles are budget-friendly, so it’s not hard to find even several cheap quality products. When purchasing a cat muzzle, it’s crucial you buy the right size – normally, small sizes will fit most cats, but medium and even large masks may be necessary depending on your cat’s breed, head size and weight (overweight cats need either medium or large size muzzles). Besides size, adjustability is super-important too. Even if you end up buying a slightly larger or smaller muzzle, adjustable Velcro straps and /or belts can help you make the right fit. Therefore, look for adjustable muzzles only (you’ll find that every mask featured on our Top Pics is adjustable). Nowadays, most cat muzzles are made of nylon, which is exactly what you want as nylon is quite tough, meaning pretty impossible to get out of, but also really comfortable for the cat. Plus, most nylons are super-easy to wash and some masks can even be tossed in the washing machine. Besides nylon, muzzles made of breathable meshes are very good too. Of course, if fast eating is your primary concern, then nylon and mesh are out of the question – in this case, you want muzzles made out of rubber. Speaking of different uses, you should also consider the fit of the muzzle – masks that cover the cat’ eyes are considered safer than those that do not, as they have a calming effect on the animal. Our advice? 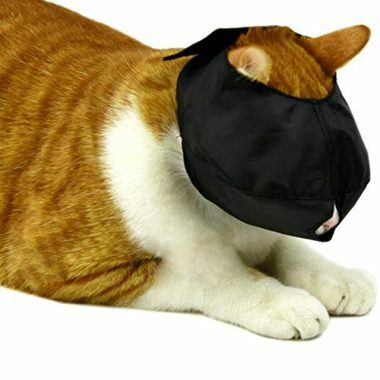 If you’re looking for a muzzle to help with grooming and vet examinations, only buy masks that cover your cat’s eyes. We already mentioned that most muzzles are quite affordable. While this is true, you can always find super-expensive… well, anything, including feline muzzles. But don’t fall for expensive cat muzzles – these masks are pretty simple devices made out of basic materials and they shouldn’t cost a lot. Choose a muzzle that fits your and your cat’s needs and preferences and pick something that is made out of a tough, durable material and you should be set for years. 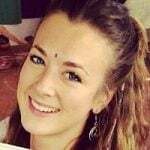 Saying that, it’s a good idea to buy from reputable brands, as they have plenty of experience, plus, they have good customer support service in case you need it. Avoid homemade cat muzzles at all costs. Most domestic cats are pretty chilled out pets– calm, peaceful and affectionate with pretty much everyone around them. Until something upsets them. If you’ve never seen a cat go from super calm to ballistic, consider yourself very lucky. Unfortunately, many pet owners know the struggles of having a one-minute-peaceful, another-minute-crazy cat, whose sudden change in behavior is usually triggered by an event that the animal perceives as dangerous. So, anything from going to the pet groomer to getting a regular vet examination to a stranger walking into your apartment can trigger such behavior. And when it happens, it can be a nightmare to deal with! But that’s why we have cat muzzles – these simple devices are meant to calm your pet down and control inappropriate behavior – if used responsibly, of course. So, without further ado, let’s get into the most important benefits of using cat muzzles. Whether your cat hates her visits to the vet or getting her nails clipped or being around other cats, biting is unacceptable. Unfortunately, calming a frenetic cat down can be incredibly difficult – unless, of course, you have a cat muzzle with you. A snug little muzzle prevents a cat from biting and chewing on things, so it’s a must for aggressive cats who cannot be otherwise calmed down. Some cats can become restless for no apparent reason which can lead to excessive meowing, especially difficult to deal with if you live in a small apartment. If you’ve tried everything to calm your kitty down but nothing seems to work, it’s a good idea to use a muzzle. Bear in mind, it’s not wise to leave the muzzle on your cat overnight, no matter how much your neighbors complain – a muzzle should only be used for short periods of time, or until the cat calms down. If your kitty is overweight and has digestive issues due to fast eating, a cat muzzle specifically designed for slowing down the eating process (such as the rubber muzzle from The Company of Animals) can greatly help. These muzzles are designed to prevent digestive problems by preventing gulping. They also provide stimulation, which can help indoor cats become more playful and energetic. Animals are not fans of things that restrict them, and cats are no exception. That’s why you’d be hard pressed to find a cat that actually likes using a muzzle. However, sometimes a situation will call for it and it may, in fact, be the only choice you have to keep your pet calm and well-behaved. Saying that, a muzzle should be treated as a last resort only – always first try to calm your pet down with words and maybe some cuddling, and then, and only then use the muzzle if you must. Usually, a visit to the vet or a pet groomer will require you to put a muzzle over your cat’s face. Occasionally, you may have to use it when at home too – if your cat is a stubborn furniture chewer, or won’t stop meowing in the middle of the night for example. Whatever the reason, there are safe and unsafe ways to use a muzzle. Let’s cover the basics so your kitty can always be safe and comfortable. Introduce the muzzle slowly: a new device, no matter what it is, may make your cat suspicious and scared at first, which is why it’s wise to introduce it slowly. Use the muzzle for very short periods of time (no more than 5 minutes) and always reward your kitty afterward with a cat treat. As your cat gets more and more used to the muzzle, increase the amount of time she’s wearing it. Use the right size: we already mentioned how important is to choose the right size of the muzzle. If you get a mask too large for your pet, she’ll paw it right off. But if you get a size too small, she’ll be uncomfortable and will dread wearing it in the future. Use the muzzle for short periods of time: no matter how good a muzzle you use is, something that covers your cat’s entire face and prevents her from meowing for long periods of time cannot be comfortable. Therefore, use the muzzle for short periods of time, or until your furball calms down. Generally, it’s not wise to keep the mask over your cat’s head for more than 20 minutes as it can affect her breathing. Q: What is a cat muzzle? A: A cat muzzle is a form of a pet mask that is used to prevent the biting, chewing and excessive meowing. It goes over the animal’s face, especially the snout, often covering the eyes as well (it has a calming effect on cats). Q: Can I use a cat muzzle on my kitten? A: If your kitten gets aggressive during his visits to the vet, it’s wise to use the muzzle to prevent biting (your vet will be thankful!). As long as you find the right size, something small enough for a kitten, it’s fine to use it when a situation calls for it. Still, the kitten should be older than 10 weeks. It’s very affordable and is made by a reputable brand. Since it checks all the important features we outlined in our Features To Look For and then some, it’s a clear winner!